CookStop has solutions for special situations. Electricians are supposed to install the stove’s electrical socket behind the stove and within a foot or two of the floor. Most stoves have a recessed area in the back for the electrical connection. Sometimes, the electrical socket is not in the standard location and the CookStop 4-wire plug-in power unit will not allow the stove to be completely pushed back against the wall. 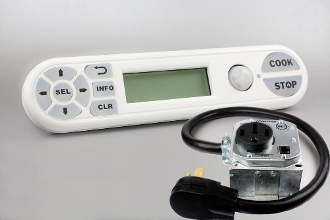 This model of CookStop provides a cord and plug to reach an existing socket in a non-typical location. Very few homes need this version and most homes are better served with the CookStop 4-Wire Plug In Kit (model CSA-4WP-IRF).